Want a reason to hate Boston? Try this: all four major teams in the city of Boston won a championship in the last decade. Care to guess how long it took Philadelphia to accomplish the same feat? The answer is 53 years. Boston has a combined 8 championships in the last 13 years. That equals the number of titles in Philadelphia in 57 years. And that figure includes three Eagles championships before the Super Bowl era and two titles from the Philadelphia Warriors basketball team. Philadelphia has three more championships (11) in 313 years than Boston earned in just 13 years. That's 8 titles in 13 years for one city and 11 titles in 313 years for the other. Ryan Howard has an average of 43 home runs and 132 RBI during his 10-year career. However, in the last two seasons he averaged 12.5 homers and 49.5 RBI, a drop off of over 30 homers and 82 RBI. Needless to say, the Phillies need the old Ryan Howard back. Howard missed 173 games over those two seasons, so his averages will improve just by getting on the field. But it will take more than simply showing up for Howard to regain his old form. Howard needs to give a better effort and his new manager was not afraid to convey that message to the public. To put this in simple terms, Ryne Sandberg called out Ryan Howard publicly. This was a direct challenge to Ryan Howard delivered to the entire fan base. Howard cannot possibly see it any other way. Ryno first challenged Howard to get into better baseball shape. "Maybe, in some ways, he'll be disappointed in this season," Sandberg said. "It all adds up to a year where he'll be ready to go. It'll all start right now with the games in Florida along with his workout program the whole winter. Him being healthy will allow him to get into baseball shape. I look for him to come back and be a big guy right in the middle of the lineup. … I know I'll have a conversation with him about continuing to have a good work ethic and get the training in he needs to this winter." Part of the reason for Howard not being in great shape, as Ryno acknowledged, is that he was not healthy enough to be in shape. But Howard cannot use that as an excuse anymore. Sandberg also challenged Howard to be better prepared overall next season. "From what I've gathered, I think he can be better prepared to face somebody to start a baseball game," Sandberg said. "Whether it's through the hitting coaches, having conversations, going over scouting reports, we have plenty of video, whatever it might be, I think he can utilize that." Those comments may appear innocuous at first, but they are about as harsh as you will hear from a manager. What it means is that the most expensive player and subsequently most untradeable player is not giving his best effort. Sandberg was careful to say better prepared rather than not prepared. No matter how he spins it, the message is clear. But Ryno did not bash Howard and was not there to criticize. Sandberg's intention, it seems, is to get the most out of the most important offensive piece in the Phillies lineup. Sandberg took a starkly different approach than his predecessor. Charlie Manuel was indeed a players manager and with that, he rarely voiced any criticisms publicly. Ryno put it right out there for everyone to see. Whether it works, well, we have to wait for that answer. The gauntlet has been raised. It is up to Ryan Howard to respond now. With so many rumors flying in every direction now that free agency is upon us, I thought it might be a good idea to put it all in one place. So, thanks to the guys at MLB Trade Rumors who do a great job of keeping us up to date on every Phillies rumor, here is a sampling of the Phillies rumorville over the past week. Cameron Rupp had a good go at it in his four September starts with the Phillies last season, hitting .308 with two ribbies in 13 at-bats. Nice job, but it doesn't trump a combined .258 average in 2013 combined between Reading (.245) and Lehigh Valley (.269). Let me start by saying $16 million guaranteed for a player with a link to PED's who had a career year at age 36 is a ridiculous sum of money and a move that will likely fail. That said, the Marlon Byrd signing was not quite as bad as it appears. First of all, Marlon Byrd's 2013 season was by no means a complete aberration. His 2013 season was undoubtedly the best of his career with a .291 average, .336 OBP, .511 slugging, .847 OPS, 24 homers, 88 RBI, and 35 doubles. But, as Beerleaguer pointed out, he had plenty of success prior to 2013. From 2007-11, he hit .291/.346/.445 with a .792 OPS and full-season averages of 16 homers and 38 doubles. If Byrd can approach those numbers it would be a serious upgrade. Secondly, $8 million per year for two guaranteed years is reasonable given the current market in baseball. Hunter Pence hit .267/.325/.483 with an .822 OPS and signed a 5 year/$90 million contract with the Giants. Slightly better numbers overall than Byrd from 2007-11 and worse than Byrd last season yielded Pence $2 million more per season for 3 additional guaranteed years. Pence was by no means the only recent bloated contract. Pence's teammate Tim Lincecum signed for 2 years/$35 million after posting a 4.76 ERA over the last two seasons. Then there is my favorite, BJ Upton signing for 5 years/$75.25 million last season. As foolish as Ruben looked jumping on Byrd and "setting the market," we may find in the next few months that $16 million for Byrd is a bargain. Thirdly, the Byrd deal might indicate Ruben is ignoring his instinct to sign another potentially crippling multiyear contract for outfielders like Shin-Soo Choo, Jacoby Ellsbury, Nelson Cruz, or Curtis Granderson. With little room under the luxury tax and $121.5 million in salary obligations for eight players prior to the Byrd signing, the Phillies cannot afford a huge free agent spending spree and still fill their needs for a catcher, two or more starters, and bullpen help. The aforementioned names will also require forfeiting a second round pick, something the Phils can ill afford to toss away. Phillies right fielders in 2013 ranked 27th in hitting (.243), 25th in OBP (.305), 20th in slugging (.405), and 22nd in OPS (.709), making Byrd an enormous upgrade. Byrd won't put up Jayson Werth numbers, but he upgrades right field significantly at only $8 million per year. Marlon Byrd may not solve all problems, but he gives the Phillies roughly $40 million to play with before reaching the luxury tax. Did you know a new Phillies rumor is generated every 3 seconds during the offseason? Yeah, I totally made that up, but it probably isn't that far off. That is why I love MLB Trade Rumors because they track all rumors and have a page devoted just to Phillies rumors (I swear I'm not making a dime for this plug!). Last week I decided to go a step further and put all of their Phillies rumors from the past week in one page. Most of you seemed to like the idea (you lazy bastards), so I am making it a regular feature (at least during the hot stove period). If you want the rumors in real time, make sure to visit MLB Trade Rumors Phillies page. Signing Carlos Ruiz to a 3 year/$26 million contract is another clear overpay, but the pile Ruben Amaro just stepped in was nearly unavoidable. There are plenty of reasons to knock this deal. Ruiz is 35. That is old. Corey Seidman pointed out on CSNPhilly.com that since 1965, only two catchers 35 or older have hit at least .290 in 400-plus plate appearances: Jorge Posada and Carlton Fisk. Only Fisk, Posada, Mike Piazza and A.J. Pieryznski had an .800 OPS after that age. The contract is also significantly costlier than most predicted. MLB Trade Rumors predicted a 2 year/$14 million contract and the Rockies were only willing to offer 2 years and $15 million. The Phillies appear to be the only team willing to guarantee a third year. It also easily tops Russell Martin’s two-year, $17 contract from the Pirates last winter. Crashburn Alley found that in the previous three seasons, only one catcher (John Buck) has earned a contract of three years or more, seven were gives two-year contracts, and everyone else received a one-year deal. Their options were limited. The Phillies have nobody in their farm system qualified as a starting catcher, and their limited budget essentially eliminated Brian McCann and Jarrod Saltalamacchia as possibilities. AJ Pierzynski is a lefty the Phillies do not need who is actually older than Ruiz. Dioner Navarro would be much cheaper, but he is also a significant downgrade. That left Chooch. This was in no way a win for the Phillies, but it wasn't a complete debacle, either. It gives the Phillies a quality defensive catcher who works well with pitchers and can hit a little. While Amaro added an older player again and overpaid again, given their options it was not the most egregious move he could have made. How much do Phillies have left to spend this off season? 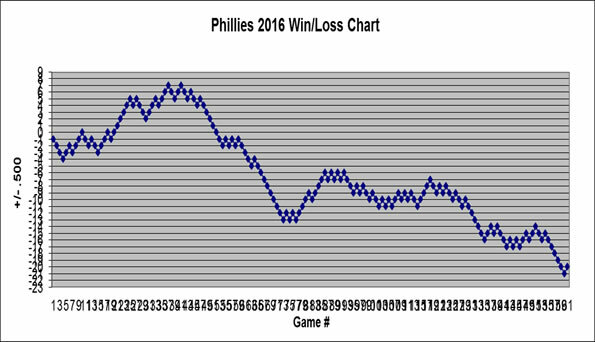 Teams who finish with 89 losses tend to have many holes to fill and the Phillies need lots of shovels and dirt. They filled two needs by signing Marlon Byrd and Carlos Ruiz, but still need to look to free agency for at least two starting pitchers and bullpen help. So, how much do they have left to spend? To answer that question, we begin with the guaranteed contracts. If we include Carlos Ruiz's still unofficial 3 year/$26 million deal and assume he earns $8 million in 2014, the Phillies have $138.5 million in salary obligations for ten players, roughly $135 million of which counts towards the luxury tax. That luxury tax threshold is based on the average annual value (AAV) of each contract, which is calculated by dividing the total guaranteed money by the number of years. Cole Hamels' contract, for example, earns him $138 million over 5 years, but it also includes a $6 million buyout in the sixth year, guaranteeing him a minimum of $144 million over 6 years and an AAV of $24 million. Even though Hamels will only make $22.5 million in 2014, it counts as $24 million towards the luxury tax. On the flip side, Rollins will make $11 million in 2014, but he has a $9.5 million AAV because it is a four-year, $38 million deal. Included in both the actual 2014 payroll and the luxury tax number is roughly $10 million in player benefits. Where we stand with their current salary obligations is a 2014 payroll of $148.5 million. Their payroll for the last two seasons was over $170 million, so if they remain at that level in 2014, they have about $21.5 million to spend. With a luxury tax figure of $145 million, it leaves them with a maximum of $44 million to spend before reaching the luxury tax. That realistically leaves Amaro with between $21.5 million and $44 million to spend on the rest of the players. Still with me? Major trades: Good deals like Lee and Halladay and awful trades like Oswalt and Pence. How the Ibanez and Polanco signings hurt the Phillies. Why Jayson Werth should have been traded. The destruction of the Pence trade. In the third installment of the newest regular feature on Phils Baseball, we run through the rumors from the past week from the guys at MLB Trade Rumors. They have a page devoted just to Phillies rumors (this is not a paid plug, honest) and all we do is put everything from the past week in one post. Captain Obvious here with an insightful observation: the Phillies are an old team. If Family Feud asked 100 people to describe the Phillies in one word, old has to be the #1 answer. Number two on that list should be expensive. Put those two together and what do you get? The Phillies are an old, expensive team. Ruben Amaro is counting on another term for the 2014 season: talented. While it is easy to point out the high salaries, increasing age, and declining skills, let's not forget that this still is a talented team. If Amaro cashes his lottery ticket this season and somehow his core can remain on the field, the 2014 Phillies should be competitive. The problem with the Phillies situation is that they have no choice but to count on older, injury prone players who hopefully can hang onto their skills just a little longer. Despite their huge payroll, the Phillies had very little to spend this offseason, which explains why the Phillies were never serious contenders in the Brian McCann/Jacoby Ellsbury/Shin-Soo Choo sweepstakes. Amaro pointed indicated in an interview last week with Mike Missanelli that he expected their payroll to be similar in 2014 to what it has been in the last few seasons, which is around $170 million. After signing relatively cheap deals for Byrd and Ruiz, the Phils have roughly five to ten million left to spend with glaring needs in the starting rotation and the bullpen. The reality of the situation is that while the core names from the talented and inexpensive 2007 team are mostly the same, their value nearly seven seasons later is quite the opposite. Let's look at the transition in graph form.